Practicing the concept of more and less (like what is 2 more than this number or what is 2 less than this number) is so important for building number sense in young learners. 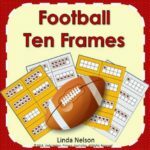 With this game, they use ten frames and practice more and less. It includes ten frames for numbers 1-20. All the ten frames have different types of bugs on them, which makes it the perfect game for spring.